When I was diagnosed with cancer many years ago, I found myself collecting inspiring quotes that I would write on little bits of paper and post around the house. Some were over my desk. Others were on the bathroom mirror or tucked inside my checkbook. But I have kept many of those inspiring quotes tucked in various corners of my life – Except now I sometimes change them out to focus on whatever I am working on at the moment. The one currently over my desk has never changed. It is a favorite because it covers a lot. It applies to everything from a new project I might be starting, to a challenge I may be facing, to a new skill I may want to learn in the world of homesteading, DIY food crafting and well…in life. Be unstoppable – from the tips of your fingers to the tips of your toes. This morning, as I sat down to write about something completely different (don’t worry, I’ll get it next week), I realized that quote was a perfect blog post topic. Because trying to live a more sustainable life or live closer to our food can feel like an uphill battle sometimes, can’t it? You start out with good intentions, but things seem to get in the way. You want to eat better, but there are conflicting reports about what is good/bad to consume. You decide to be more organic, non-gmo, hormone-free, etc but so much of that food can be expensive. This makes you decide to do most of it (or at least some of it) yourself, but so many of the skills needed feel complicated and time-consuming to learn. And many sources make you feel that you need an acre of land and goat to be part of the DIY and artisan food movement. Or they make you feel that you can’t possibly learn enough to even grow your own food. And this leads to thinking that perhaps this is all just too overwhelming to even start. 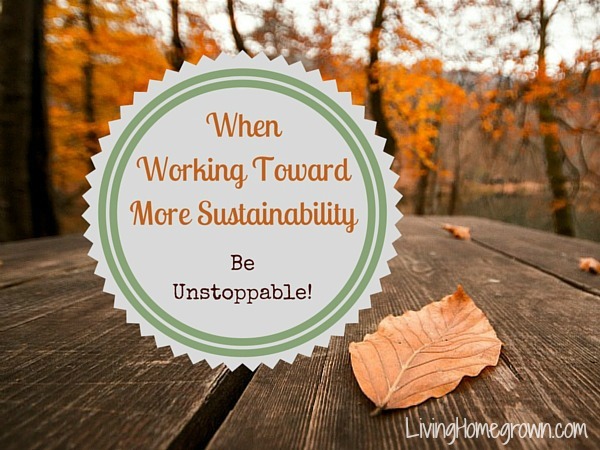 Don’t let your current situation stop you from living the sustainable lifestyle you want to have. All you need is a willingness to dive in. It’s all about baby steps, not giant leaps. It helps to have a mentor, a few books or just few friendly bloggers (wink) to guide you and freely share what they know. But the trick is to dive in and tackle it bit by bit. And slowly, you will see the shift and the change toward the life you yearn for. You may start by buying organic produce occasionally at the local farmer’s market and before you know it, you have tucked a few veggie seeds into a flowerpot on your balcony. Boom! You are one step closer. And there is always more to learn. That is the beauty of this lifestyle. You are never “done”. What does happen is that you are always moving on to the next adventure! There is always more to learn and more projects to try and THAT is what makes this so darn fun! Don’t let that quest for knowledge feel overwhelming. Instead, embrace it. It is what makes this a wonderful and delicious life-long project. So, I just wanted to congratulate you for taking this journey. I know you are on it because you are reading this. And I’m glad we are on this journey together as we both learn new skills and share/exchange what we learn. I loved this post. Thank you! It was just what I needed to read this morning. Theresa, I WAS feeling overwhelmed about making these changes! I’m making a career change – as well as a change (gradually) to a much healthier lifestyle… & I’m having to do all of this, with no money. Reading this post has helped me so much! (Partly, it helped just knowing that I’m not ALONE in feeling overwhelmed! Lol.) Thx so much! Honestly, tonight it all felt overwhelming. So thank you for this post. I did get to the farmers market today to buy a gazillion organic apples to make your applesauce, so I guess that was one small step forward! I think that is a Giant step Barbara. Good job. I think we all need to hear this sometimes. I know I do. Oh my gosh: yes! I love this. One small change I’ve made lately: once a month I buy local, organic milk. I’ve been fretting over what a small thing this is– I wish I could afford this stuff the other three weeks of the month. But this post makes me feel… unstoppable. Start small. “Boom.” I am one step closer. Thank you. You are welcome. I think that is an excellent step. Just keep putting one foot in front of the other and enjoy the journey. I am a nurse and I listen to your podcast driving home after work. It gives me peace and a little rejuvenation of the spirit. Thanks! You are welcome Allison. I’m so glad you are enjoying the episodes. I absolutely love your advice, focus is so important no matter what we’re trying to do, I have just recently found your podcast and blogs, Iam hooked. You do an excellent Job! Thanks so much.